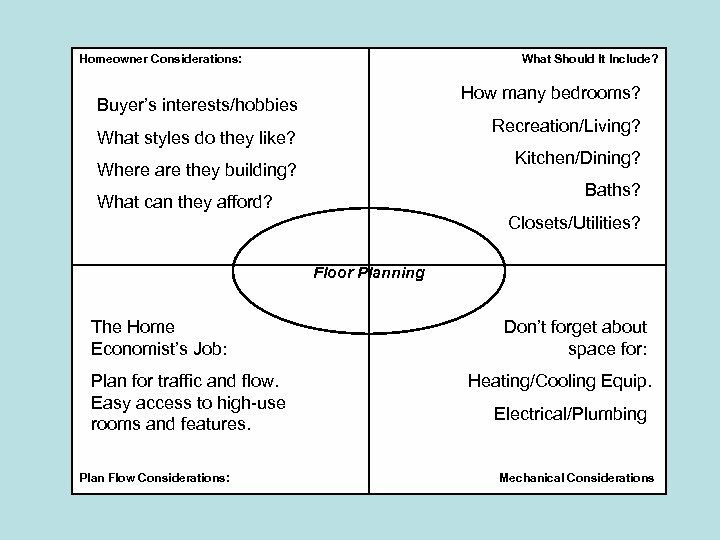 Layout and Design How do I develop appropriate floor plans? 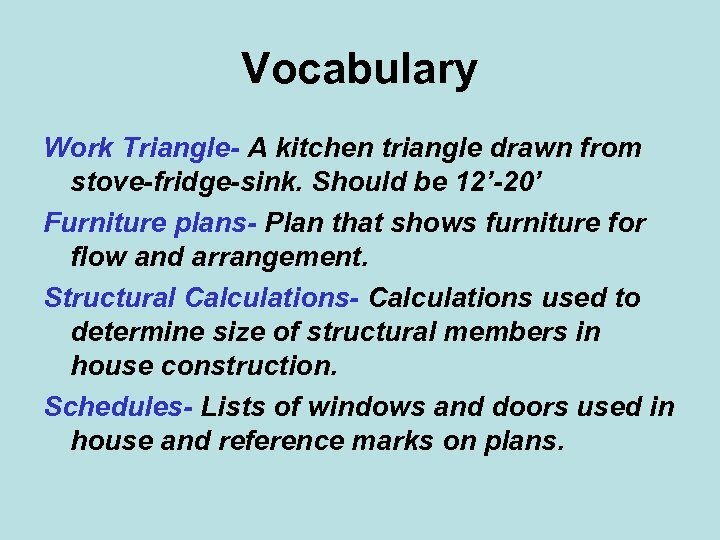 Vocabulary Work Triangle- A kitchen triangle drawn from stove-fridge-sink. 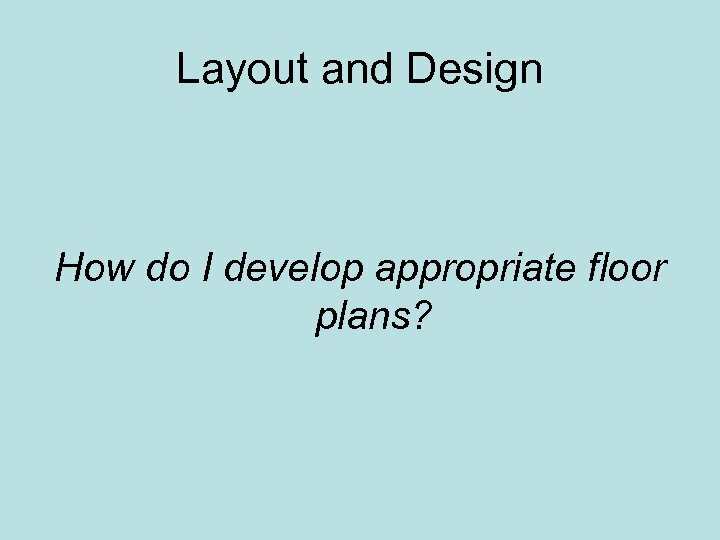 Should be 12’-20’ Furniture plans- Plan that shows furniture for flow and arrangement. 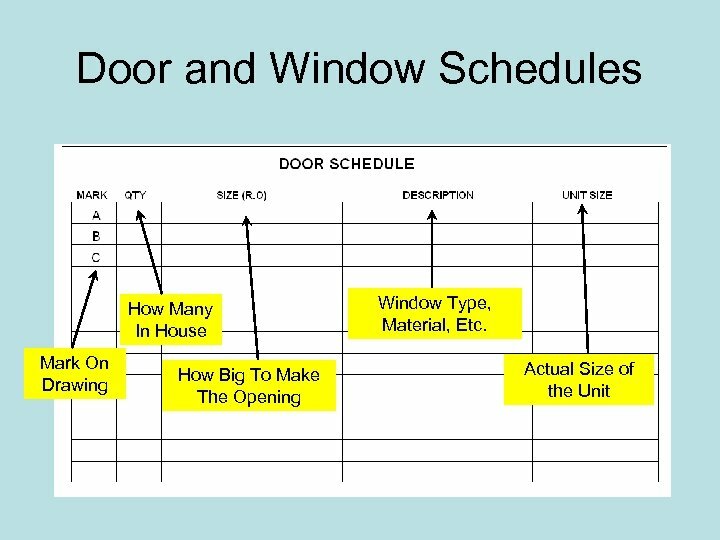 Structural Calculations- Calculations used to determine size of structural members in house construction. 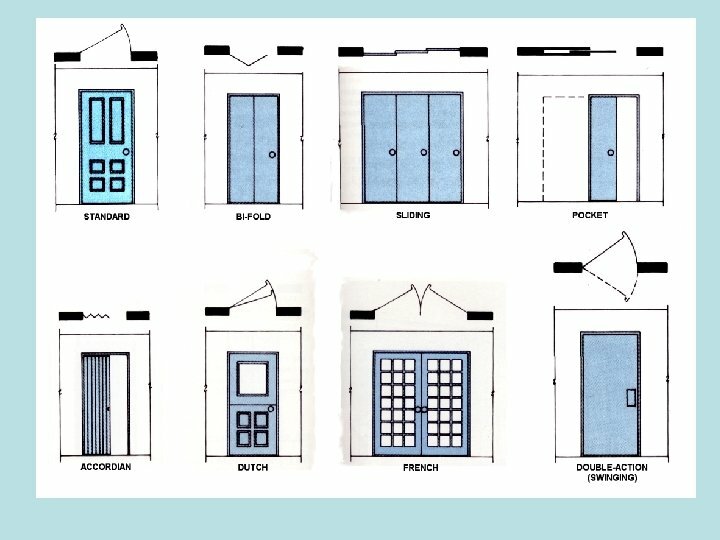 Schedules- Lists of windows and doors used in house and reference marks on plans. 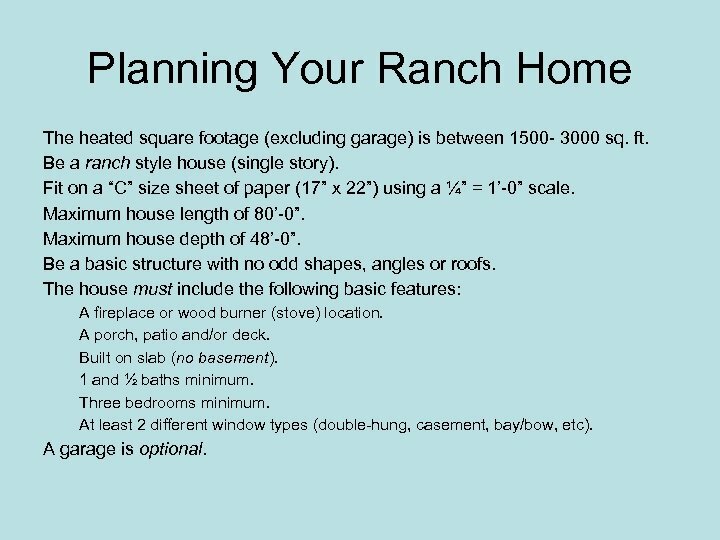 Planning Your Ranch Home The heated square footage (excluding garage) is between 1500 - 3000 sq. ft. Be a ranch style house (single story). Fit on a “C” size sheet of paper (17” x 22”) using a ¼” = 1’-0” scale. Maximum house length of 80’-0”. Maximum house depth of 48’-0”. Be a basic structure with no odd shapes, angles or roofs. The house must include the following basic features: A fireplace or wood burner (stove) location. A porch, patio and/or deck. Built on slab (no basement). 1 and ½ baths minimum. Three bedrooms minimum. 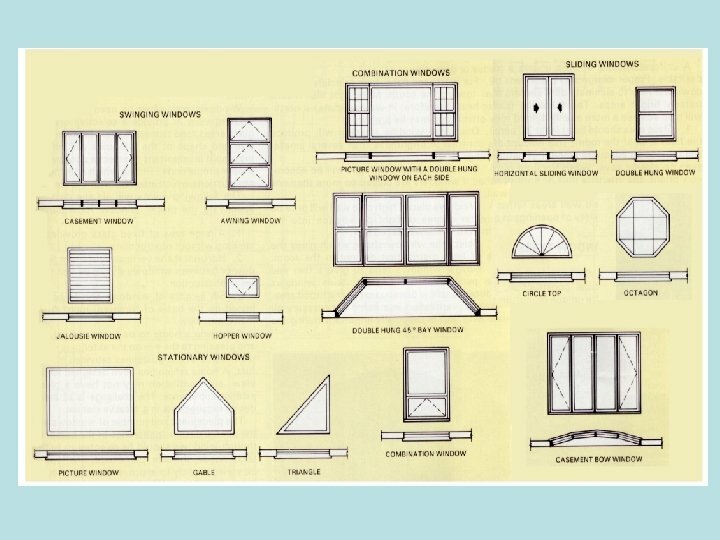 At least 2 different window types (double-hung, casement, bay/bow, etc). A garage is optional. 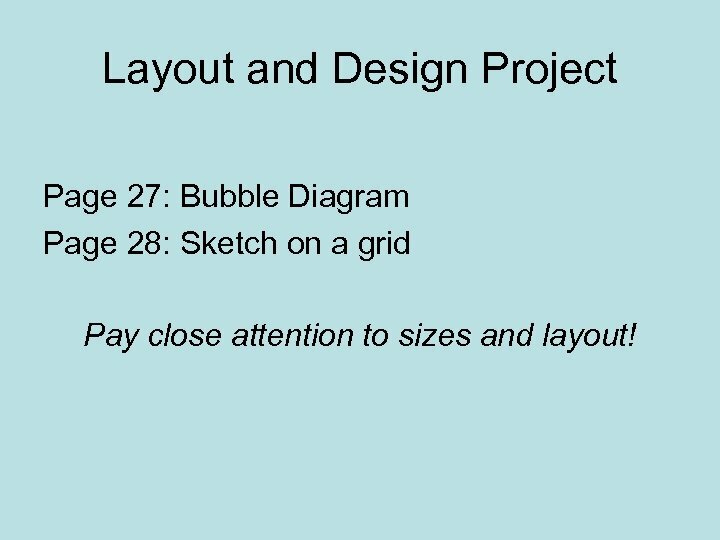 Layout and Design Project Page 27: Bubble Diagram Page 28: Sketch on a grid Pay close attention to sizes and layout! 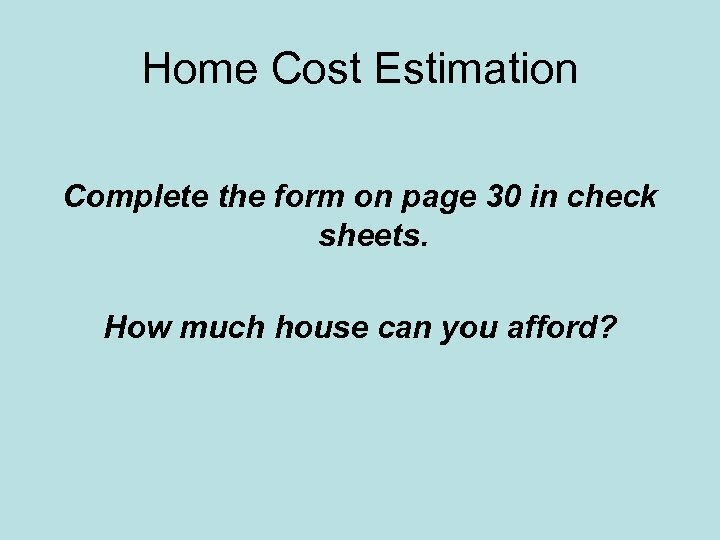 Home Cost Estimation Complete the form on page 30 in check sheets. How much house can you afford? 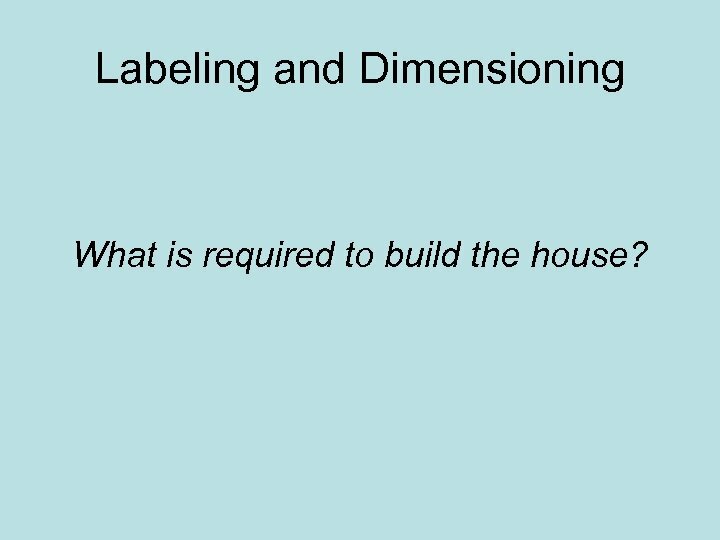 Labeling and Dimensioning What is required to build the house? 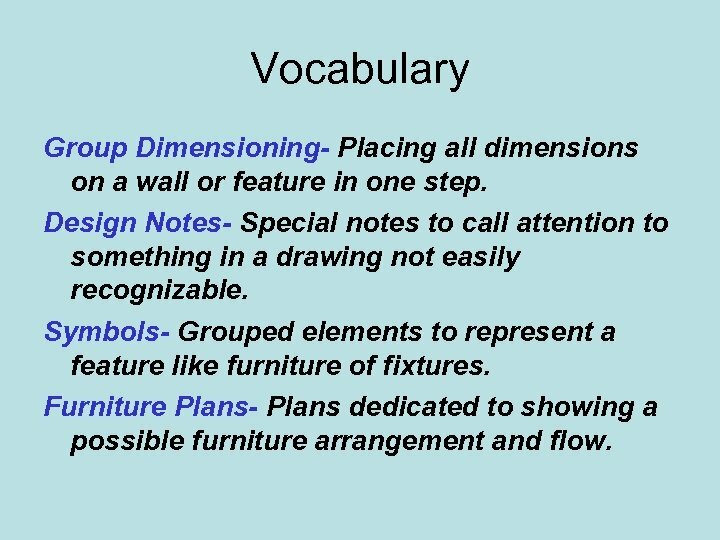 Vocabulary Group Dimensioning- Placing all dimensions on a wall or feature in one step. 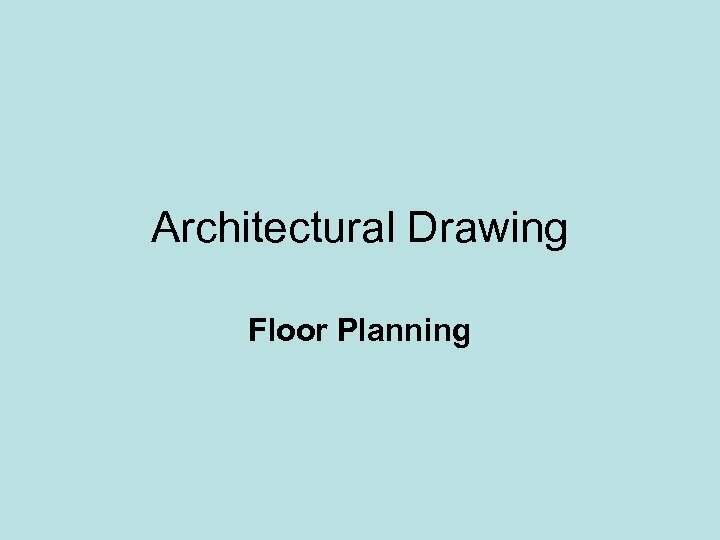 Design Notes- Special notes to call attention to something in a drawing not easily recognizable. 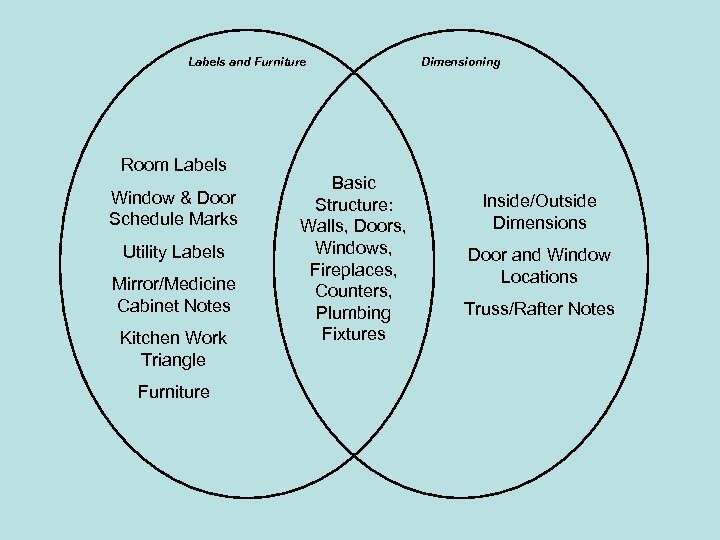 Symbols- Grouped elements to represent a feature like furniture of fixtures. 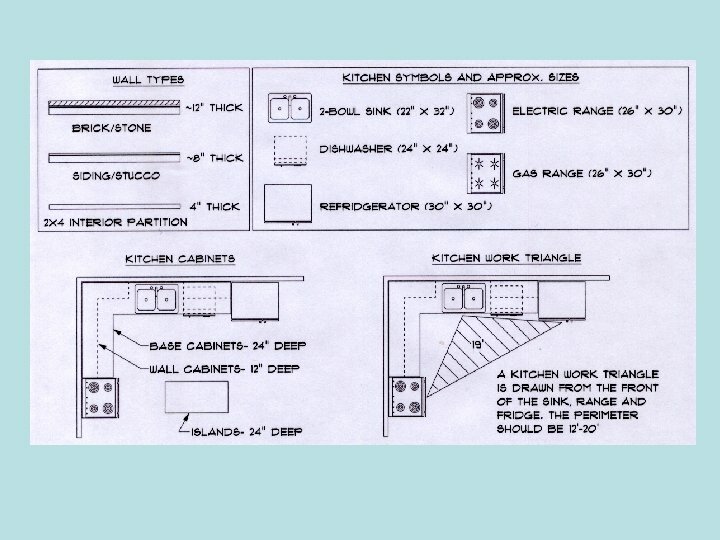 Furniture Plans- Plans dedicated to showing a possible furniture arrangement and flow. 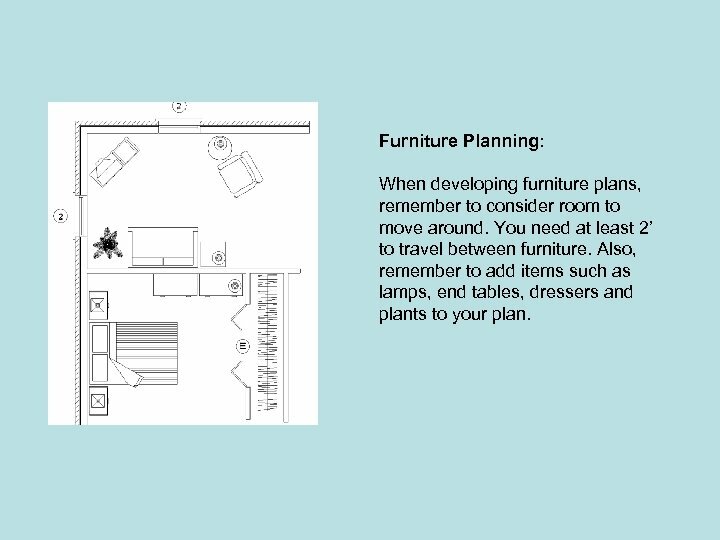 Furniture Planning: When developing furniture plans, remember to consider room to move around. You need at least 2’ to travel between furniture. 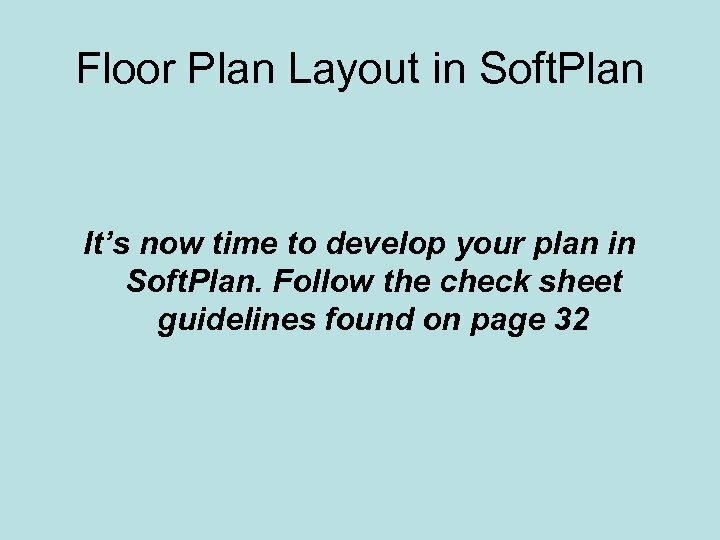 Also, remember to add items such as lamps, end tables, dressers and plants to your plan. 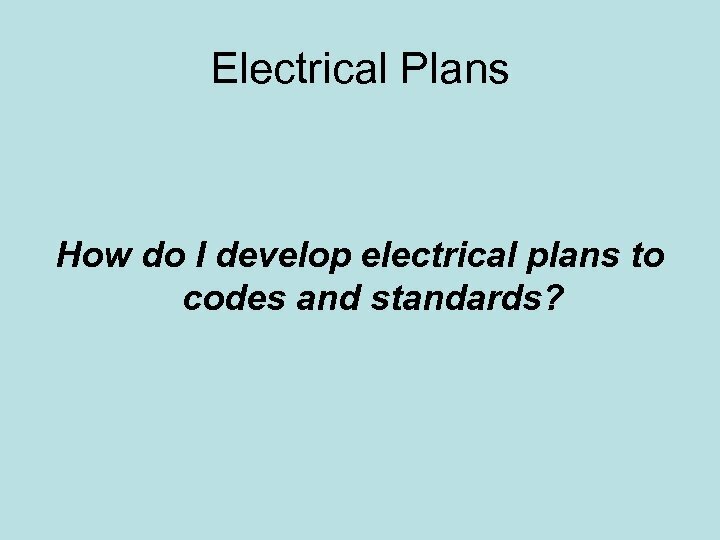 Electrical Plans How do I develop electrical plans to codes and standards? 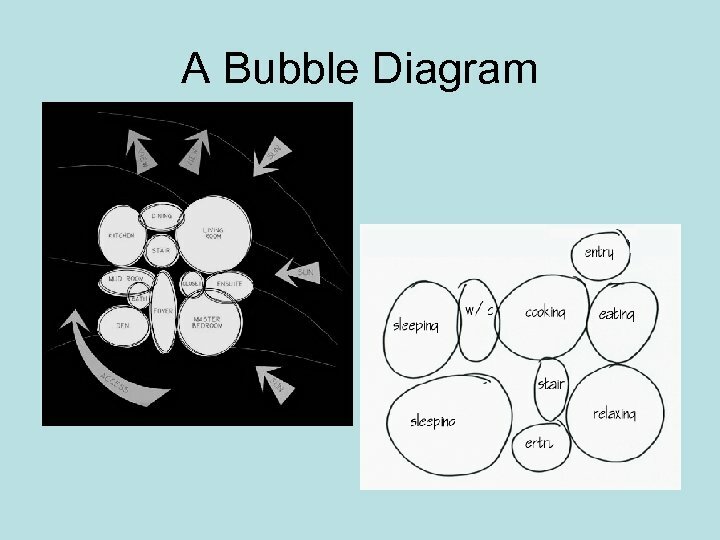 Rules and Regulations: What Do We Draw? 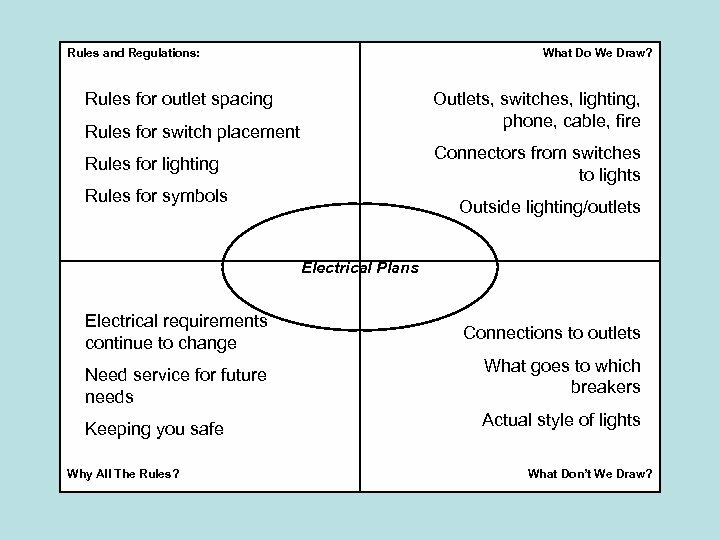 Rules for outlet spacing Outlets, switches, lighting, phone, cable, fire Rules for switch placement Connectors from switches to lights Rules for lighting Rules for symbols Outside lighting/outlets Electrical Plans Electrical requirements continue to change Need service for future needs Keeping you safe Why All The Rules? Connections to outlets What goes to which breakers Actual style of lights What Don’t We Draw? 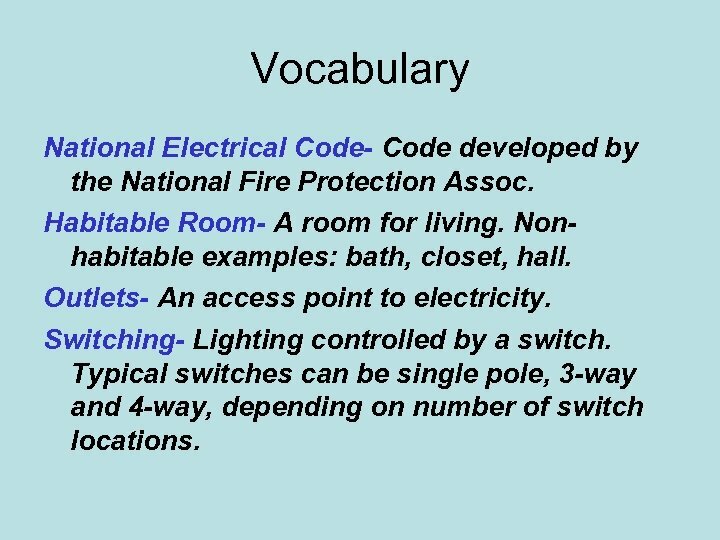 Vocabulary National Electrical Code- Code developed by the National Fire Protection Assoc. Habitable Room- A room for living. Nonhabitable examples: bath, closet, hall. Outlets- An access point to electricity. Switching- Lighting controlled by a switch. 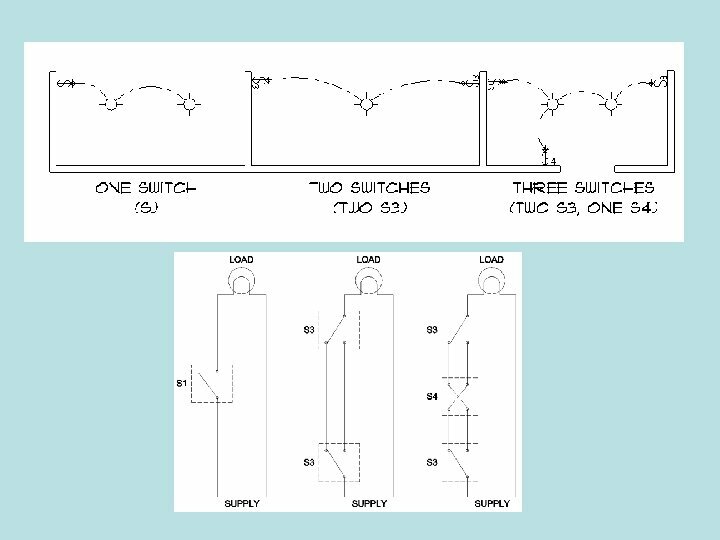 Typical switches can be single pole, 3 -way and 4 -way, depending on number of switch locations. 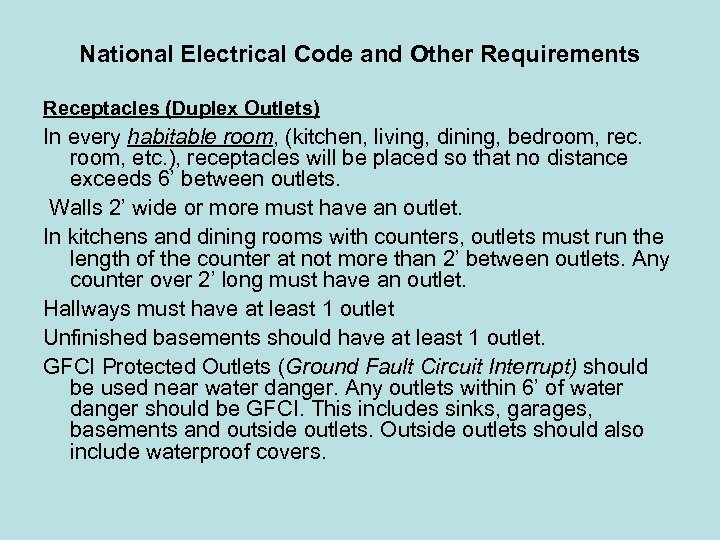 National Electrical Code and Other Requirements Receptacles (Duplex Outlets) In every habitable room, (kitchen, living, dining, bedroom, rec. room, etc. ), receptacles will be placed so that no distance exceeds 6’ between outlets. Walls 2’ wide or more must have an outlet. In kitchens and dining rooms with counters, outlets must run the length of the counter at not more than 2’ between outlets. Any counter over 2’ long must have an outlet. Hallways must have at least 1 outlet Unfinished basements should have at least 1 outlet. GFCI Protected Outlets (Ground Fault Circuit Interrupt) should be used near water danger. Any outlets within 6’ of water danger should be GFCI. 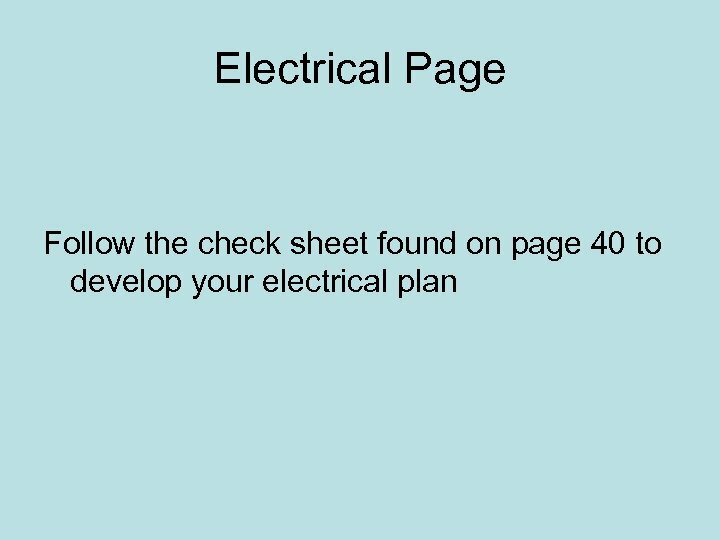 This includes sinks, garages, basements and outside outlets. Outside outlets should also include waterproof covers. 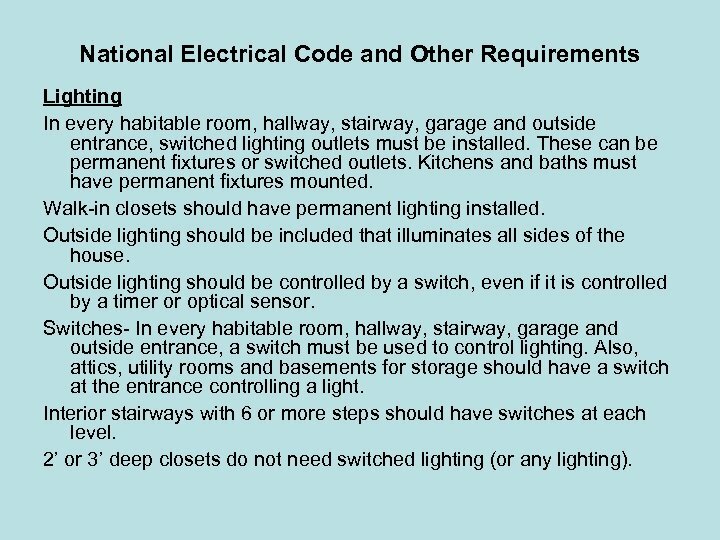 National Electrical Code and Other Requirements Lighting In every habitable room, hallway, stairway, garage and outside entrance, switched lighting outlets must be installed. These can be permanent fixtures or switched outlets. 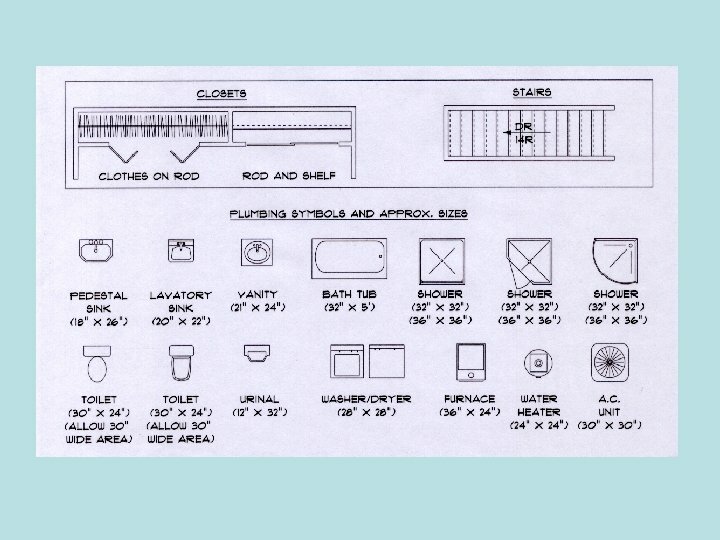 Kitchens and baths must have permanent fixtures mounted. Walk-in closets should have permanent lighting installed. Outside lighting should be included that illuminates all sides of the house. Outside lighting should be controlled by a switch, even if it is controlled by a timer or optical sensor. 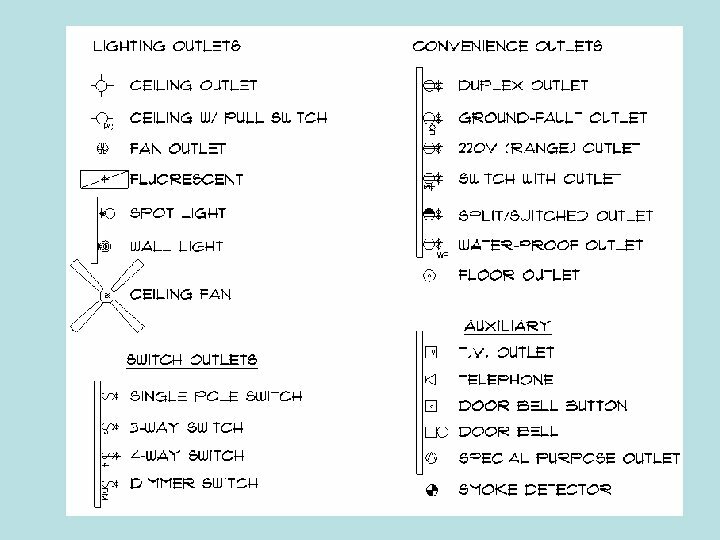 Switches- In every habitable room, hallway, stairway, garage and outside entrance, a switch must be used to control lighting. Also, attics, utility rooms and basements for storage should have a switch at the entrance controlling a light. Interior stairways with 6 or more steps should have switches at each level. 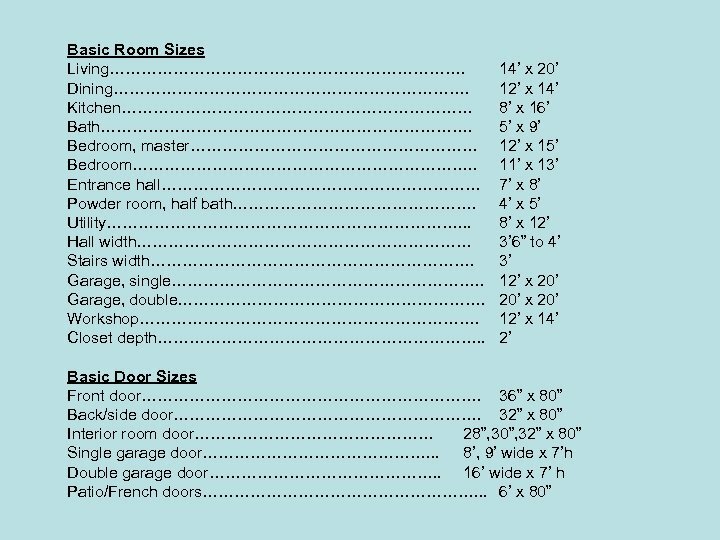 2’ or 3’ deep closets do not need switched lighting (or any lighting). 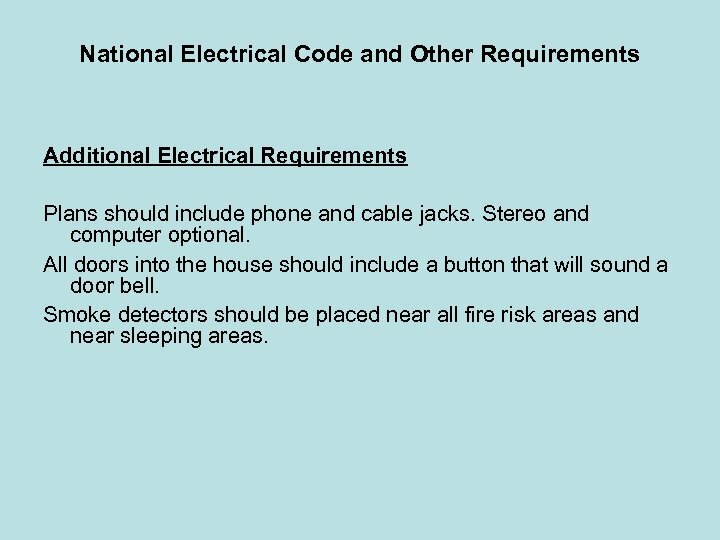 National Electrical Code and Other Requirements Additional Electrical Requirements Plans should include phone and cable jacks. Stereo and computer optional. All doors into the house should include a button that will sound a door bell. Smoke detectors should be placed near all fire risk areas and near sleeping areas.